Awarded to one recipient for significant and lasting contributions and service to his or her institution while embodying an unbridled spirit in service for the betterment of his or her institution, state, region, or the profession in general. Recipients should have a demonstrated record of service as a positive change-agent in service to their students, colleagues, and peers. 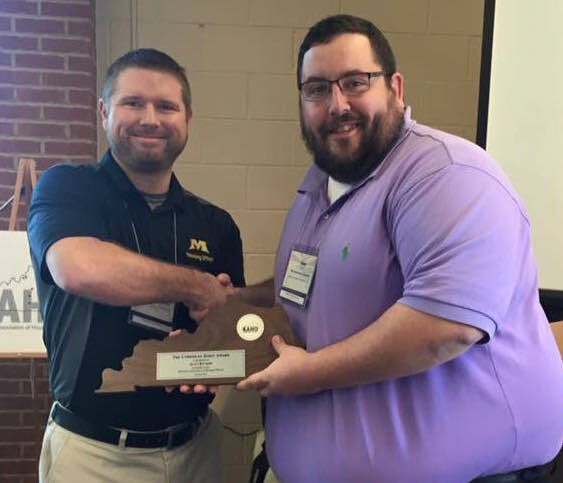 Join us in congratulating Alan Rucker, from Morehead State University! Nominations for awards are often filled with hyperbole and inflated tone, but it is an absolute honor to nominate Alan Rucker for the inaugural KAHO Unbridled Spirit Award. Though his accomplishments and “wins” for the KAHO organization and our department at Morehead State University have been numerous, lasting, and forward-thinking, it is the manner with which those wins have been accomplished and driven that make Alan a perfect nominee to be recognized for achievement and attitude. On our campus, Alan has been a driving force in changing the game at MSU for our housing department. A department that has historically been seen as insular and territorial is now seen as an engaging and successful campus colleague. Championing causes like cross-campus collaboration, technology, and innovative solutions has been the hallmark of Alan’s time through three positions. Currently, a programmatic effort with intercollegiate athletics has seen dramatic increases in on-campus residents attending sporting events, especially non-revenue sports. It also saw intercollegiate athletics staff, cheerleaders, and mascots assist with hall openings. Alan has also been instrumental in changing our staff structure and recruiting the perfect hall staff to fill those roles, a fact that has not gone unnoticed by the campus community, as message after message finds its way to me about the team we have from all over our University. Outside of housing, Alan also serves as a co-chair for the Greek Life Task Force, creating a fraternity and sorority living-learning community, one with Alan as the classroom instructor. He advises two student organizations and also served as our unit’s development officer for our campus campaign. Despite changes in leadership (two Deans of Students, two Directors, and three Assistant Directors), three different job functions, and ever-changing departmental priorities, Alan has always been a positive and vocal leader, setting the bar for what a staff member at our university should attempt to achieve. His work groups are always committed, loyal, and passionate to whatever causes they undertake and it is a safe bet to say the successes and “atta boys” we have recently achieved would not have been as prevalent or as loud were it not for Alan’s leadership, attitude, or drive. Stretching outside the MSU campus, Alan has also had a hand in making the KAHO experience above and beyond their expectation for colleagues across the state. At the 2014 annual conference, hosted here at MSU, Alan was the driving force behind an exemplary conference experience with top tier guest services like short term gym admittance, our campus ropes course at no charge, an entertainment event at our Star Theater, and outstanding cuisine. The conference experience showcased our campus and our organization and would not have been as successful, as customer-centric, or as positive without his service. Alan currently serves in a SEAHO State Rep position on the KAHO Governing Council, where he has championed a new virtual home for KAHO with dedicated webspace and a more inclusive and informative communication plan to increase participation across the state. It is a pleasure to recognize someone that can be a shining example to other professionals of what is possible despite obstacles and organizational barriers when they are overcome with a positive attitude, sense of humor, and personal connection. That is the definition of unbridled spirit and makes Alan Rucker incredible deserving of this award.